Some of you have asked me where to get IAFF Obama signs, shirts and stickers. Click on the link above. I've also heard that the union office was going to get some stuff, but so far, I haven't been told that they have received anything. Here's a video from Wisconsin that shows some of our brothers and sisters in the fire service, and others in public service, and why they are voting for Obama. 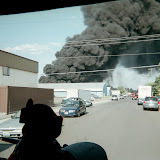 NARRATIVE: On Saturday October 4, 2008 at 11:31 AM, Six Companies of Spokane Firefighters, 3 Engines, 2 Senior Ladders and 1 Heavy Rescue under the direction of Battalion Chiefs Sabo and Green responded to a reported structure fire at 817 East Indiana. The first company arrived within 6-minutes and reported light smoke showing from a two-story wood-framed home. Spokane Police Officers were already on-scene and had responded to a call for a subject actively setting fires from the exterior of the home. Ladder 2 and Engine 7 were utilized to extinguish the multiple fire starts and the additional companies still enroute were cancelled as the incident was brought under control in just minutes. There were no injuries to either civilians or firefighters. PROBABLE CAUSE: A 17-year old male suspect was detained by SPD as fire companies arrived on scene. Spokane Fire's SIU Officers were still on the Mission Incident and quickly joined SPD early in the incident. The suspect is now in custody and charged with Arson in the First Degree. Additional charges may be forthcoming; however at the time of this release the suspect has been booked into the Spokane County Jail. DAMAGE EXTENT: Damage is minor and predominately exterior and cosmetic to the home. NARRATIVE: On Saturday, October 4 2008 at 5:08 AM, 6 Companies of Spokane Firefighters, 3 Engines, 1 Senior Ladder, 1 Pumper Ladder and 1 Special Rescue under the direction of Battalion Chiefs Kirsch and Fielder responded to a reported structure fire at 22 East Mission. The first company arrived within five minutes and reported smoke showing from a two-story wood framed house. The older home was remodeled into an apartment with two separate units (one upstairs and one on the ground-level). Both units were not occupied at the time of the fire; however one tenant had multiple animals which were still inside. The well-coordinated efforts of the Spokane Firefighters resulted in the fire being located, extinguished and overhauled within an hour. Multiple animals were also removed safely by firefighters and are being cared for by a responsible neighbor. PROBABLE CAUSE: ** (UPDATED) The cause has been determined to be incendiary and SIU Investigators have charged Beverly Nagi (57 y/o) with Arson in the First Degree. SIU Officers arrested Nagi near the fire scene this morning and she was subsequently booked into Spokane County Jail. DAMAGE EXTENT: Significant damage to the rear exterior and nearby interior walls throughout both floors of the structure. The Spokane Chapter of American Red Cross is assisting the resident. NARRATIVE: On Saturday, October 4 2008 at 5:08 PM, 6 Companies of Spokane Firefighters, 3 Engines, 1 Senior Ladder, 1 Pumper Ladder and 1 Special Rescue under the direction of Battalion Chiefs Kirsch and Fielder responded to a reported structure fire at 22 East Mission. The first company arrived within five minutes and reported smoke showing from a two-story wood framed house. The older home was remodeled into an apartment with two separate units (one upstairs and one on the ground-level). Both units were not occupied at the time of the fire; however one tenant had multiple animals which were still inside. PROBABLE CAUSE: The cause is under investigation by the Spokane Investigation Unit. DAMAGE EXTENT: Significant damage to the rear exterior and nearby interior walls throughout both floors of the structure.